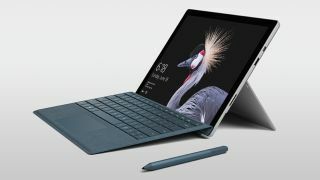 At the close of last month, Microsoft announced that the Surface Pro LTE would go on sale come December 1, but now it appears that the spin on the hybrid, which sports cellular connectivity, might not be out until next spring. Note that this information was detailed in the FAQ of Microsoft’s online store on the product page for the 2-in-1, although it appears to have since been removed. We’ve reached out to Microsoft for clarification, but it seems like a delay is quite possibly in the cards. If we have to wait until spring, that means March at the earliest, and that would represent a three-month delay on the previously announced on-sale date. Note that when it does arrive, the Surface Pro with LTE will only be available with a Core i5 processor, and there’ll be no Core i7 model (apparently due to issues with fitting in the LTE modem and the Core i7 CPU’s fan). So that’s one compromise buyers will have to live with on the performance front, although the trade-off is, of course, being able to work online while on the move. Meanwhile, if you’re eyeing other Surface hardware which is actually currently on sale, we are hoping to see some impressive discounts on Microsoft’s hybrids when Black Friday arrives.